Scary Ghost Stories 2 : Related by a young man. "When I was small I used to follow my father to the musolla. Sometimes I followed him to far away places and sometimes I just accompanied him to nearby places. I like being with him, besides being a good son I really like to sit at the back seat of his motorbike, and to have adventurous journey almost every night. I like the weather at night, especially when the wind was blowing cold towards my neck. One night, as usual I followed my father. However, that night we didn't travel by his motorbike because my mother was coming along. We went by car. Actually during the day we went to Malacca just for fun, shopping and sight seeing. On our way back my father headed straight to the musolla because there was going to be a speech on that night and we were going to be late if we went home first. When we arrived, no parking space was available near the musolla, so my father had to park his car beside the graveyard. My father went inside, but my mother and myself waited in the car because the speech was going to end in half an hour. My mother asked me to lock all doors, so I did what my mother told me to do. While I was locking the doors, I accidentally looked at the graveyard. I looked everywhere within the graveyard and saw several banana trees. I wondered whether the trees were producing fruit or not. 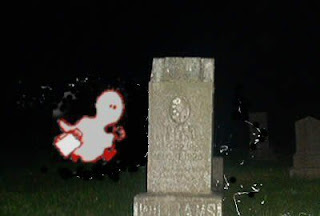 Suddenly, I saw something weird on a grave located just three meters from where I was sitting in the car. It was a head, and I was sure with what I saw. The head was sitting just beside the tomb. I called my mother, but she didn't answer. I looked again, and I saw the head was showing a smirk at me. I felt very scared and kept calling my mother but she didn't answer me. I began to panic when suddenly I heard a knock on the car window. It was my father. "Dad! Look! Over there!" I told my father about what I saw but he didn't see it. I looked at the spot again, but the head was gone. I was very sure it was there before, but then it was gone! I asked my mother whether she saw it or not, since she sat in front and the grave is nearer to her. She said she was sleeping just then and didn't see anything before she closed her eyes. I was disappointed because I couldn't prove what I saw to my parents. I was scared, very scared indeed but I kept everything inside. It happened 16 years ago but the memory still lingers inside my heart. Now I've moved out, following my father but occasionally I pass through the same graveyard again but now I am using my own car. I will look at the particular spot every time I pass by. how can the teller pass through the same cemetery? thats bravery! I like the way you write. Good story.